What is the process for setting up an agreement with OEWD (Non CDBG funds)? What are the standard insurance requirements in City agreements? Can the standart insurance requirements in City agreements be waived? What are the steps to do so? If I have subcontractors/subgrantees are part of my agreement, how quickly do I need to pay them for their services? What are the procedures for setting up an amendment to an existing agreement? May I add line items to the budget that do not appear in the template? May I bill for an administrative fee? How can I track spending and budget? What triggers a budget modifcation? When can I request one, and how should it be submitted? What are indirect costs? Can I include indirect cost rates in my budget? Are there any restrictions? Is there a rate across the board for all programs? Our budget does not have a budget line for an item we will be billing for. Can we bill against a different line? What is cost allocation? What are the cost allocation methords most commonly used? How do I allocate shared staff (staff that is not directly working on the program) and general expenses appropriately? How do I get paid for my work on my OEWD project? What is cost reimbursement? How is this different from a deliverable-based budget? When should I expect invoice reimbursement? When should I contact OEWD if I think my payment is missing? If I have multiple City agreements, will I receive separate or combined payments? What should I do if we have exhausted the funding in a specific line item in the budget? Is food an allowable cost? Is it allowable to purchase equipment? What if I need to repurchase equipment that has been damaged, lost, or stolen? Can personal expenses be billed to the program? Can we retroactively charge for costs incurred but not invoiced in prior months? Can charges be billed when incurred outside of the contract term? Can the "rent" budget line be used to offset my agency's mortgage payment? When new staff is introduced or changed in the program, how do we indicate the change on the invoice? Can we pay unused vacation with OEWD funds? How do I become a City Bidder and Supplier? What are the business identification numbers my organization will need? Where can I find more information on Ordinances related to contracts and grants? How do I submit a single audit to the Federal Audit Clearinghouse? How can I find the CFDA numbers associated with the funding I received? How can I find the OEWD Directives? How can I find more information on determining our indirect cost rate? Where can I find the OMB Circular A-122? What is the process for setting up an agreement with OEWD? After the RFP or RFQ review period has closed, qualified providers are contacted to negotiate awards and scopes. The scope of work includes description of services, deliverables, timeline, and reporting requirements (i.e. invoicing) which is provided by and negotiated with the assigned program officer. Simultaneously, a standard budget template is provided and negotiated in order to finalize the budget for the program. All allowable, reasonable, and necessary costs required to execute the scope of work in the grant agreement are identified through negotiation of the budget. Once this process is complete, OEWD’s Contracts Team will prepare the appropriate agreement and send it to the provider for review and signature. Normally, OEWD will request that the documents be returned with all appropriate signatures within a week. Once the provider returns the agreement, it is then sent to OEWD’s Department Head and City Attorney for another set of signatures. Contracts are sent to the Office of Contract Administration for the final set of signatures. After the agreement is fully countersigned, the grantee/contractor is sent one original agreement for their records and is instructed to begin invoicing per the agreement terms. What are the standard insurance requirements in City agreements? Can the standard insurance requirements in City agreements be waived? What are the steps to do so? Workers’ Compensation, in statutory amounts, with Employers’ Liability Limits not less than $1,000,000 each accident, injury, or illness. Commercial General Liability Insurance with limits not less than $1,000,000 each occurrence Combined Single Limit for Bodily Injury and Property Damage, including Owned, Non-Owned and Hired auto coverage, as applicable. In addition, Commercial General Liability and Commercial Automobile Liability Insurance policies must be endorsed to name as Additional Insured the City and County of San Francisco, its Officers, Agents, and Employees. The Workers Compensation policy shall be endorsed with a waiver of subrogation in favor of the City for all work performed by the Contractor, its employees, agents and subcontractors. Depending on the type of services being offered, organizations may also be required to provide proof of Errors and Omissions or Professional Liability insurance. Insurance requirements can be waived; however, providers must request a waiver in writing by providing a legitimate justification that does not conflict with the scope of services. The city’s risk management office will then make a decision upon review. 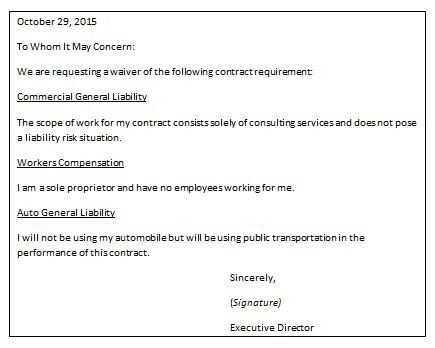 The waiver request letter should include the date, signature, and justification for the request. Please see the sample letter below for additional reference. For providers with multiple agreements, each agreement requires a new waiver request. If I have subcontractors/subgrantees as part of my agreement, how quickly do I need to pay them for their services? The grantee should pay the subcontractor on the payment schedule established in the subcontracting agreement and before the grantee receives the City reimbursement for the services delivered. It is expected that when a grantee makes agreements with subcontractors that they adhere to the same policies OEWD has established with the grantee. Because City grants are cost reimbursement agreements, it is also expected that payment has already been issued prior to the lead organization requesting reimbursement from OEWD. The received date will be recorded when all supporting documentation has been received with the invoice and payment will be issued by OEWD no later than 30 days after the received date. Changes made to a current agreement which affect program scope, agreement terms, or budget require an amendment to the grant or contract. The assigned program officer will negotiate the revised scope of work, goals, terms, and budget, as appropriate. The contracts team will generate the amendment for signature, notifying the grantee when funds have been encumbered and the grantee can begin invoicing. No. OEWD's budget and invoicing system reflects set descriptions for allowable line items. Grantees can contact their grant coordinator if they have questions about their budget and how to classify items not listed on the template. No, this is not an allowable cost. For projects in which the grantee named in the agreement is a fiscal agent administering a subcontract and not directly responsible for program delivery, a fiscal agent fee may be appropriate. These flat, agreed-upon rates are negotiated on a case by case basis with the program officer, and are only allowed with General Fund dollars. This is not an indirect cost rate. Indirect costs are allowable, which are a percentage of direct costs negotiated in the budget, to cover organizational costs which are shared and unable to be directly allocated (e.g. general overhead). Indirect rates can only be calculated on direct cost reimbursement charges, and not deliverables. Agencies with an approved federal indirect rate calculation letter are eligible to exceed typical OEWD indirect rate caps. Your original program budget is useful for tracking spending and remaining balances. The TGS system is helpful in showing your original budget and remaining balances. Please refer to the Using Report Builder in TGS overview for more information on how to create reports and pull queries. What triggers a budget modification? When can I request one and how should it be submitted? A budget modification is necessary when there are anticipated changes in budget spending or projections. A budget modification should be requested if there is a need to shift budgeted costs or if there is a shift of more than 10% between roll up items. Although you can shift 10% between major line items, you cannot shift between service categories (i.e. from Participants to Salaries). In order to request a budget modification, CBOs must submit a revised budget template (using allowable budget line items) to the Grant Coordinator, including a reasonable justification for the modification being requested. Once it is reviewed, the grant coordinator will inform the CBO of the status. Once approved, the revised budget will be made available for billing against. Budget modifications are limited to three per year, and are not accepted in the first quarter or near the close of the fiscal period. Exceptions require approval from the Grant Coordinator. Shifting funds between fund sources is not allowable (e.g. from WIOA Adult to WIOA Dislocated Worker). For TGS projects, the revised budget will be modified into an entirely new project in the TGS system. Indirect costs are those that have been incurred for common or joint objectives and cannot be readily identified with a final cost objective. Indirect cost rates can be included in your budget. They can include such things as: administrative staff, clerical staff not dedicated to specific programs, office space used by those staff, equipment used by everyone, marketing expenses, accounting costs, audit costs, etc. A uniform indirect rate for all programs is not established or enforced by OEWD. For those that have a current Federally Approved Indirect Cost Letter, we will continue to honor up to the approved indirect rate as stated in the letter. Please budget as needed and provide a copy of your letter with all appropriate supporting calculations (so we can see the base as defined in your agreement) when you submit your draft budget. For those who have had a negotiated indirect rate in the past but currently do not have an active one in place, you may not budget or charge the de minimus rate. Instead, you may budget all necessary and allowable charges as a direct cost. For General Fund projects, a federally recognized rate is not required and we do accept up to 12% for an indirect rate if needed. These rates can be negotiated during the budget setup process. An explanation of what is included in the indirect expense calculation may be required to be submitted for approval. At a minimum, grantees should retain documentation and an explanation of the rate for review during their annual fiscal monitoring site visit. Our budget does not have a budget line for an item we will be including in our monthly invoices. Can we bill against another budget line? No, a budget modification request will need to be submitted to your grant coordinator to allow for invoicing against the appropriate budget line for the expense. What is cost allocation? What are the cost allocation methods most commonly used? Cost allocation is the process by which a nonprofit allocates indirect and shared costs across programs and administration. Cost allocation is important because it helps a nonprofit to capture the true cost of their activities and to allocate overhead costs appropriately and equitably. The City’s cost allocation guidelines for nonprofit contractors largely follow those described by Generally Accepted Accounting Principles (GAAP) and in 2 CFR, Part 230. Cost allocation methods vary, just as cost types do. The objective of the method used is to ensure reasonableness and equity. Your organization is likely to use several different bases for allocating different types of costs. Once your organization establishes a method of allocation, that method should be used consistently throughout the program or fiscal year and be described in your cost allocation plan. One reasonable methodology for allocating costs uses Personnel Allocation (FTE’s); to use this process, there must be a documented time distribution system. With a time distribution system, costs flow to the area of work emphasis, which normally correlates to funding. This system works well with budgets because it creates a cost per position relation for expenditures. For example, supplies are stored centrally and used by all staff in performing their jobs. It is reasonable to conclude that the supplies are used in the same manner and for the same purpose as the time spent by staff while using the supplies. It is acceptable to use FTE’s distribution as the basis for allocating the cost of supplies to various cost categories. Other commonly used methods of cost allocation include square footage, number of participants served, and time studies. To find out more information regarding methods of cost allocation, please contact your grant coordinator. Shared staff and general expenses that are not directly program related can be included as part of your indirect costs. Please see the indirect cost question and cost allocation question for more information on these topics. Follow the instructions for submitting an invoice provided in Appendix C of your agreement. In most cases, providers submit the Funding Request and Schedule 1 To Request for Funding along with the required supporting documentation within ten days after the month that expenses were incurred or the deliverable was approved by the OEWD program manager. Invoice documents must be submitted electronically via email to oewd.ap@sfgov.org. Budgets may include cost reimbursement line items, deliverables, or a combination of the two. Cost reimbursement line items (e.g. salary, supplies) are those which are paid by the grantee and then reimbursed by the City. These items require supporting documentation (e.g. payroll records, invoices, cancelled checks) to verify that payment was made prior to submission of the invoice. Deliverables are tasks which are paid for upon completion (e.g. reports, festivals, analyses) for a pre-agreed dollar amount. Grantees can expect payment approximately 30 days after the completed invoice packet with all supporting documentation is received. However, any questionable or unsupported costs may delay approval and processing of payment. Your assigned grant coordinator will communicate with you to resolve any concerns and questions. Please contact your grant coordinator if it has been more than 30 days from submission and payment has not yet posted to your account. Grantees with multiple city sources or multiple grants could receive a check or electronic payment with multiple project payments lumped into one amount. This is more likely to happen now since the new F$P system is processing all payments from all city departments at the same time. You should be able to log in to your F$P account to review each check to see which payments are being combined. A budget modification should be requested if a budget line has been exhausted but additional expenses are expected to be incurred. It is recommended that after each quarter grantee fiscal leads analyze spending trends and work with program officers to determine budgeted areas that may not be spent down. This will allow for consolidation of budget lines to increase the exhausted line through a budget modification. Food is an allowable cost if reasonable and necessary given the scope of work. Please note that the City prohibits expenditure of City funds for sugar-sweetened beverages and bottled water. Is it allowable to purchase equipment? Can equipment be considered an incentive? What if I need to repurchase equipment that has been damaged, lost or stolen? Yes, equipment purchases are allowable. Please refer to OEWD’s Equipment & Information Technology Systems Request Form. Equipment purchases of $1,000 or greater require pre-approval using the Equipment & Information Technology Systems Request Form. Disposition date, sale price, loss, theft, etc. All service providers shall promptly report to the Office of Economic and Workforce Development (OEWD) all allegations of potential fraud, abuse, and other criminal activity. Any loss, damage, or theft of equipment shall be investigated and fully documented in order to be replaced. OEWD and each service provider shall establish appropriate internal program management procedures to prevent any criminal activity. The incident reporting process shall ensure that all instances of fraud, abuse, or other criminal activity associated with WIOA-funded activities are concurrently reported to the State of California Employment Development Department (EDD) through OEWD. CDBG will not reimburse equipment purchases of $1000 or more or any subcontract expenditures unless we have a Form H (Request for Approval of Subcontract and Equipment Purchase) previously approved by the grant coordinator with the required documentation (explanation of use of equipment and amount to be paid by CDBG, etc). Contractual services and equipment purchases under $1000 do not require prior approval from MOH/OEWD and do not require submission of Form H.
For equipment purchases and subcontracts of $100,000 or more, you are required to publicize your needs in the City’s Purchasing Department. This is done by following the instruction on the Form I (Bids and Contracts Database Information Form). Advance payments are rarely allowed and if approved, only for select non-federal funding sources. For more information, please contact your grant coordinator. Yes, provided your agency has a policy to reimburse for personal expenses. The charges must be appropriate and necessary to the program. In certain instances for example, if a personal cell phone is used for business-related purposes, then a percentage of the expenses may be included in the invoice for reimbursement. In the event that you find you have missed a cost on a monthly invoice, you have the option to reconcile these charges in a subsequent invoice for reimbursement given that the expense is reasonable and allowable. These should ideally be invoiced within the same quarter, and never outside the grant term. However, the charges must fall within the active fiscal year as reimbursements from a closed fiscal year are not possible. Please keep in mind that the City of San Francisco’s fiscal year begins on July 1 and ends the following June 30. No, charges must be incurred within the contract term dates to be eligible for reimbursement. Can the “rent” budget line item be used to offset my agency’s mortgage payment? The building for which you want to charge rent must house activities or personnel required by the scope in the grant agreement. However, OEWD approval must be obtained prior to including costs in an expense report. The agency must provide an assessment which includes calculations based off the fair market value of the space in the area (dollars per square footage). For example, you can gather a sample of three spaces located in the immediate vicinity, average out the cost per square foot, and then apply that to the agency’s space. The analysis of fair market value will be reviewed, and if approved, will be included in the contract file and attached to the invoice as additional documentation required to support the amount requested for mortgage payments billed against the rent budget line. The TGS system allows for addition of staff names as needed. No, grant funds can only be used to reimburse documented payroll expenses. An agency can request reimbursement for vacation utilized by and paid to an employee. However, an agency cannot request reimbursement for accrued vacation time that is not realized as a payroll expense. Vacation accruals are allowable as long as the expense is within the grant period and appropriate for the percentage of the FTE being charged to the program. Below are models of acceptable methods of billing for vacation accruals. The chosen methodology should be consistently applied to all employees being billed to the grant. A: Vacation expenses become a billable cost to contracts when an employee actually takes vacation and is paid for previously accrued vacation hours. The advantages of this method are that it is easy for the contractor to administer, easy for the city to monitor, and it provides for even cash flow throughout the contract period. This is the method most frequently required for billing government grants. B: Vacation expenses become a billable cost to contracts when employees earn the vacation. However, in this case, when actual vacation hours are paid, those cost cannot be billed. Most organizations do not keep a separate general ledger account that reports vacation time paid (separate from other types of wages), so it is difficult to pull these unbillable costs out of the agency’s financial reports. An advantage is that the exact amount of vacation earned is billed in the contract period. Disadvantages are that the cash flow to the contractor can be uneven during vacation months because the cost was previously billed and reimbursed in small increments. It also requires additional accounting by the contractor and may be difficult for the contractor to track if not all funders allow this method. For those intending to utilize this method, please contact your grant coordinator for additional backup documentation may be required. Severance pay is allowable if required: 1) by law, 2) in an employer-employee agreement, 3) in established organizational policy, or 4) is agreed through circumstances of the particular employment (Number 4 applies to those entities covered by 2 CFR 220 and 2 CFR 230 only). The expense must be within the grant period and billed using an appropriate percentage of the FTE being charged to the program. This list provides descriptions and locations of several of the commonly used business identification numbers. EIN #– An Employer Identification Number (EIN) is also known as a federal tax identification number, and is used to identify a business entity. No need to renew number. DUNS # - Before you can bid on government proposals, you need to obtain a Dun & Bradstreet, or DUNS Number, a unique nine-digit identification number for each physical location of your business. TTX # - All San Francisco businesses must obtain a Business Account Number from the Office of the Treasurer and Tax Collector (TTX). Business Registration renewal is due annually by May 31. The annual fee is calculated based on gross receipts of the prior tax year. Supplier # - Approved suppliers have met all compliance requirements necessary to conduct business with the City of San Francisco. In the new Financial System Project, this ten-digit number replaces the previous vendor number. Maintain annual compliance with business tax and registration, current insurance, equal benefits compliance, and Secretary of State registration (for corporations or LLCs). LBE Certification # - With this number, successful applicants can receive rating bonus points when bidding on City contracts as Local Business Enterprises (LBE), PUC Local Business Enterprises (PUC-LBE), Non-Profit Entities (NPE), or Small Business Administration (SBA) designees. Applicants can also indicated whether they are a Woman, Minority, LGBT, or Disabled Veteran Owned Business, or a Recognized Green Business. Maintain compliance with certification requirements. Vendor # - This five-digit number was the previous ID number for entities doing business with the City and County of San Francisco; it has been replaced by the Supplier #. How can I find the CFDA numbers associated with the funding my agency received? Catalog of Federal Domestic Assistance numbers are associated with federal funding sources only, and should be provided in an appendix to your grant agreement or contract. For more information, visit https://www.cfda.gov/. How can I find OEWD Directives? Where can I find the OMB Circular A–122 (information on cost principles for non-profit organizations)? OMB Circular A-122 has been relocated to 2 CFR, Part 230. Please visit this link to review the information. OEWD San Francisco Nonprofit Sustainability Initiative – Learn more about resources supporting the long-term health of the San Francisco nonprofit sector, and register for updates. Nonprofit Space Investment Fund and Nonprofit Space Stabilization Program – Support for San Francisco nonprofit organizations seeking long-term leases and permanent affordable space. San Francisco Office of the Controller - Resources for Nonprofits – Forms, guidelines and training materials to support nonprofit compliance with Monitoring visits. Resources for Nonprofit Financial Management – Resources for nonprofit financial planning, monitoring, operations and oversight, developed by Fiscal Management Associates and the Wallace Foundation. CompassPoint Resources – Helping leaders, organizations and movements committed to social justice realize their full power. Foundation Center – Leading source of information on philanthropy, fundraising, and grant programs. Taproot Foundation – Helping social change organizations achieve their missions by ensuring that pro bono service is a readily available, effective, trusted and commonly used resource. Workforce GPS: Navigate to Success – Online communication and learning technical assistance platform to develop innovative approaches to workforce and economic development, sponsored by the U.S. Department of Labor’s Employment and Training Administration. Workforce GPS On-line Training - Highly recommended online self-paced training modules to serve clients better and improve program performance. Earned Income Tax Credit & Other Refundable Credits (EITC) – Partner toolkit and promotional material to encourage clients to learn more about EITC. AmazonSmile – Fundraising opportunity for registered charitable organizations to receive donations of 0.5% of the price of eligible AmazonSmile purchases made by organization supporters. Virtual Warehouse - Online items reuse system for surplus goods submitted by San Francisco City Departments for reuse, open to all non-profits with 501(c) status and schools. SaverLife San Francisco – Community campaign designed to motivate 1,000 Bay Area residents to kick start a savings habit. Save just $20 per month for six months and SaverLife matches $60. Zenni Optical – Online prescription eyeglass company providing affordable high-quality eyeglasses. Ford GoBike Bike Share for All – Discounted membership and access to bicycles for Bay Area residents ages 18 and older who qualify for CalFresh, SFMTA (Low Income) Lifeline Pass, or PG&E CARE utility discount.